Each snowman has little arms that come out for shipping. These unique Christmas Snowmen are designed by hand from driftwood collected along the beaches of the beautiful Central Coast of California. Mary, her husband, and dogs go on regular adventures to the beaches to gather seasoned driftwood for hand carved unique Driftwood Snowmen. 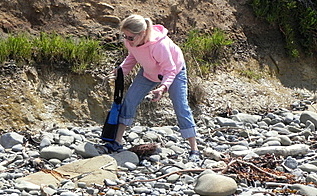 Pacific Coast beaches are lined with driftwood, shells, stones and other magnificent ocean material. Each trip to the beach yields a new collection of material used to design these wonderful handmade, hand carved, and original snowmen. Each snowman is different, original, and totally unique. Her Snowmen are beautiful and creative. Indeed, these pieces are collector's items. She decorates each Christmas Snowman with shells, dried seaweed, sea glass and/or Jadeite. It takes a special skill to form a Snowman from a raw piece of driftwood. We are certain you will cherish your own personal driftwood Snowman from the hands of Mary Elton Wilkerson. Mary sees driftwood differently than most people. She says the wood talks to her telling her if it is a Cross, Snowman, Santa or some other unique piece. Her designs have become collectors items throughout the United States. She has been producing creative carved art for over 30 years and she puts love and attention into each piece she designs. A handmade Christmas Snowman is designed exclusively from driftwood and other material found on the beach. These pieces make a fantastic conversation piece. In addition, the mystery attached to a piece of driftwood makes for great day dreams about where the wood came from and its age. If driftwood could talk what stories it could tell. A driftwood snowman makes a great decoration for during the Christmas season or any other time of year. These special handmade Snowmen make a great gift for any occasion. 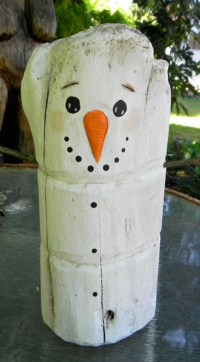 We know you will be proud to own a unique driftwood Christmas Snowman designed and handmade by Mary Elton Wilkerson. If you don't find that special piece that speaks to you just send us a note with your ideas and Mary can design one especially for you. we will be more than glad to help you with special orders. Each Christmas Snowman in this gallery has a special page dedicated to its description and price. All you have to do is select the Snowman you would like to view in a larger image and click. These special pages also have information about the Snowman, prices and ordering information. Take your time viewing Mary's handmade Christmas Snowmen and if you have any questions please contact us today. In addition to our contact page we have a page dedicated to customers service and secure payment and privacy. We Do Accept all Major Credit Cards Through Paypal. You do not have to open an account in order to purchase our products through PayPal. We want to make your purchase easy, safe and pleasant. In addition, we have a 100% satisfaction return policy. To learn more about our policies visit our customer service page. Copyright � 2010. All rights reserved. Created by Creative Exploits.